Hijackers diverted a Libyan plane carrying 118 people to the Mediterranean island of Malta on Friday and threatened to blow it up with hand grenades, officials said. Tense negotiations ensued and within a few hours at least 65 passengers were allowed to leave the plane, the prime minister said. 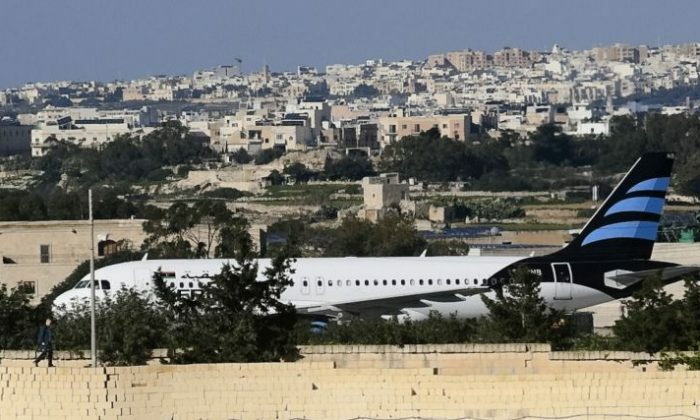 The hijacked Airbus A320 flight, operated by Afriqiyah Airways, was traveling from the Libyan oasis city of Sabha to Tripoli when it was diverted to Malta. Malta state television TVM said the two hijackers on board had hand grenades and had threatened to explode them. Emergency teams were immediately dispatched to the site of what the Malta airport agency called an “unlawful interference” on the airport tarmac. All flights into Malta International Airport were diverted. Malta’s National Security Committee was coordinating the hostage operation, a government statement said, and a negotiating team was on site. An official from Afriqiyah Airways said the two hijackers had expressed a willingness to release the passengers but said they would keep the pilot. The company said there were 118 people, including the crew, on board. The doors of the plane opened at 1:44 p.m. and a staircase was moved over to its door before passengers began disembarking. Maltese Prime Minister Joseph Muscat said in a tweet that 65 people left the hijacked plane so far. All were seen leaving the aircraft without hand luggage. It was not clear why the plane was hijacked or what the demands of the hijackers were. Serraj al-Fitouri also told Dubai-based Al-Arabiya TV that one Libyan lawmaker was among the list of passengers. It was unclear whether the lawmaker, identified as Abdel-Salam al-Marabet, was actually on the flight.